Summer Chocolate Poke Cake | All That's Fair. It’s been a while since we featured a recipe! Especially one with “cake” in the title. This recipe has many variations, one of which you’ve probably seen before. The one my mom always made growing up features cool whip, chocolate cake mix, crumbled Heath bars, and sweetened condensed milk plus caramel sauce drizzled in holes in the cake (hence, the “poke” portion of the name). Mix cocoa, flour, sugar, baking soda, and salt in a large bowl. Stir in water, melted butter, and vinegar. Beat until smooth. Butter a tube cake pan and dust with flour. Bake in oven at 350° degrees for one hour or until toothpick is removed dry. Now comes the fun part! Let your cake cool slightly. Then grab a wooden spoon and poke holes all through the cake, going down about halfway through. Drizzle the sweetened condensed milk and caramel sauce on top, then set cake aside to cool completely. Spread the cool whip over evenly over the top of the cake, then sprinkle with Heath pieces. I’ve also had this with Butterfinger instead of Heath pieces, and it’s fantastic! Feel free to get creative here. This cake would be perfect on a warm summer evening, sitting around the patio with friends. 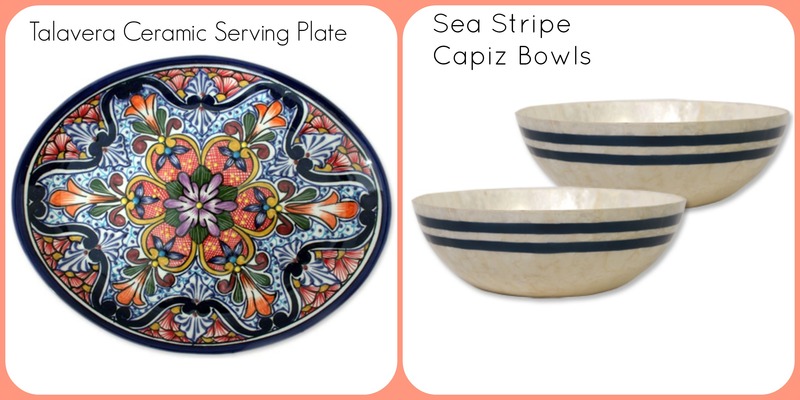 You can plate the whole thing on our gorgeous Talavera Ceramic Serving Plate, then dish it up in individual portions in these elegant Sea Strip Capiz Bowls. Just because a dinner party is outside doesn’t mean it shouldn’t be fancy! 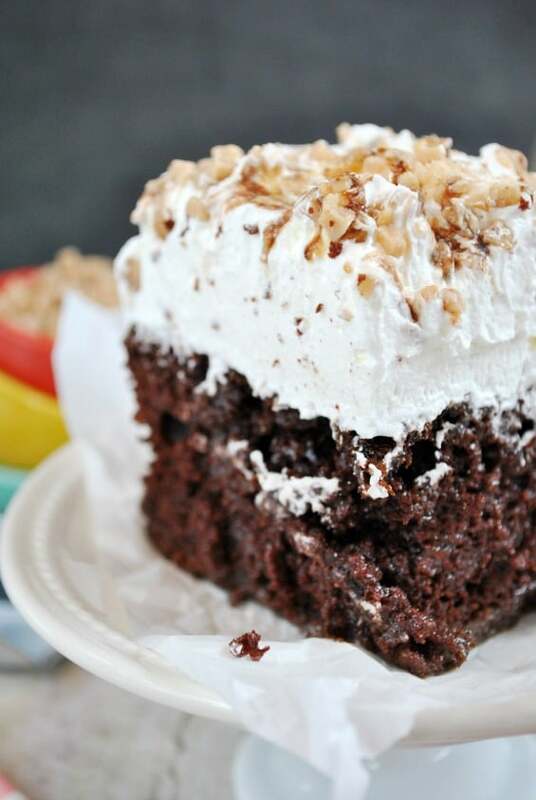 This entry was posted in General, Recipes and tagged fair trade cake, fair trade chocolate, fair trade dessert on May 23, 2014 by Casey Trogden.